My wife and I make a pilgrimage to Lake Quinault a couple of times a year. Not long ago we were hiking an old growth trail there when we heard a peculiar sound that we’d never heard before. It was an aircraft that seemed close overhead. It sounded like an Olympic-sized god was tumbling rocks in a food processor. It was likely a U.S. Navy Growler practicing over the Olympic Peninsula. The Growlers are known for their noise and have been flying a greatly expanded series of training exercises over the Olympic Peninsula out of their base on Whidbey Island. They are $67 million-machines and they train over the peninsula some 16 times a day 260 days a year. The number of Growlers will eventually grow from around 100 to 160. 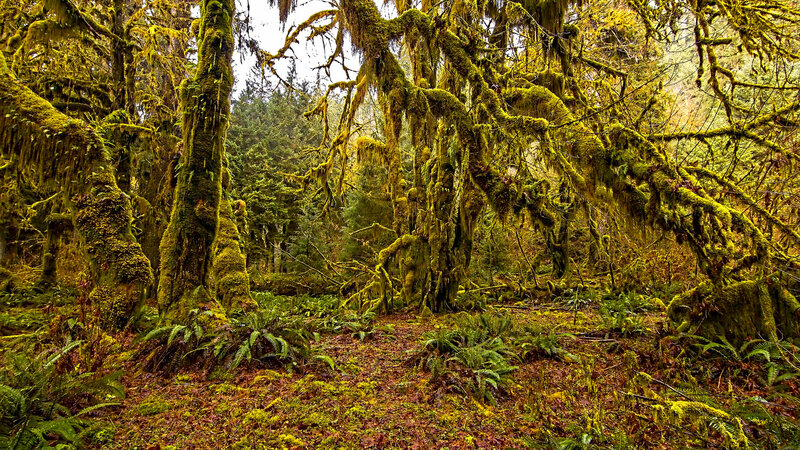 They operate over many of the most scenic and wild areas of Olympic National Park, from Ozette down to Moclips, over the Hoh Rain Forest visitor’s center and Lake Quinault. Some might say it’s the “sound of freedom,” but many others, especially wilderness lovers, are growing very frustrated at the intrusion of noise pollution into wild areas, especially the park. Unlike the Blue Angels, this is not once-a-year noisemaking. It’s an almost everyday occurrence. Unfortunately, quiet isn’t what it used to be. They say if you were hiking along the Hoh River in the rainforest before the Navy upped its flights that you could go an hour or more without hearing a human sound. The interval, I heard, is now down to about 20 minutes thanks the the Navy’s warplanes. The Peninsula—remote and relatively unpopulated—has been used for military purposes for a long time: fortifications along its shorelines, training in forbidden zones off the Pacific coast, and over-flights. My parents used to tell the story of hiking from Cape Alava to La Push in the 1940s when a Navy fighter decided to empty his guns on that remote stretch, assuming it was empty. My mom and dad had to drive for cover behind driftwood while the pilot strafed the beach with live ammo. Still, the park has been a haven, an oasis of nature largely protected by the public. The National Parks Conservation Association—nearly a century old and and the oldest park advocacy group in the U.S.—is one of many organizations trying to get the Navy to take its training exercises elsewhere. Suggestions have ranged from Idaho to California. Areas in the latter, like China Lake, have long been used for testing and training using the empty Mojave desert. My father was stationed there during the war at a training base. It’s also where test pilots “pushed the envelope” to move us into the jet and space eras. The Navy’s use of the Olympics is due to convenience—their air station is nearby on the north end of Whidbey Island. The stepped up training intrudes on the Olympics, but also the San Juans, Salish Sea and even Vancouver Island. But making a case for quiet is not easy. Pilots need to train, city dwellers are used to high levels of noise and light pollution. And not everyone has heard that silence is at risk, or cares. Last week, I attended the premiere of a new eight-minute documentary, Hear Our Olympics, sponsored by the Northwest regional office of the NPCA. It lays out the case for quiet with beautiful footage of the Olympic mountains and forests and the “threat to the park’s soundscape.” The film also features activists who oppose the Navy’s exercises over the park, like Dave Youngberg from Forks, a Navy vet of the Vietnam-to-Gulf War era. For some vets, the Growler sounds spark fear and panic triggering lingering PTSD. The Navy’s current permit allowing the flights will come up for review in 2019. It is hoped that this beautiful film with stunning footage will help raise the alarm (quietly, however). John Muir also wrote that “The clearest way into the Universe is through a forest wilderness.” He lived at a time, however, when the music accompanying nature’s gateway wasn’t the soundtrack of fighter jets, sounds that form a new kind of barrier to the true wilderness experience so many seek.